Back in Blighty, a tremendous fuss is under way following a TV series focusing on meals supplied by the Schools Catering Service. Ah, school dinners – what nostalgia. By coincidence, or convenience, the schools featured are all in SE London, where I was raised as a vegetarian before E numbers came to define ingredients. As a 'bulge baby', born shortly after World War II as troops returned to their wartime brides, my diet was healthy; because of food shortages, rationing was still in force. The Ration Book Diet's low fat, high fibre and sensibly-sized portions meant that the British population enjoyed a level of health and fitness unsurpassed since 1945. 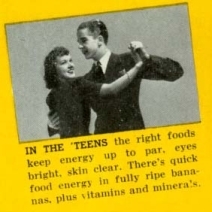 There was no surfeit of sugar or salt; instead daily supplements of orange juice and malt extract, as well as foul-tasting cod liver oil were provided at school. We also drank a third of a pint of milk, a daily treat that Maggie Thatcher, the Milk Snatcher, did away with in 1976. I didn't have school dinners in primary school (grades 1-6) ~ my sister and I were able to walk home at lunch time when we were fed bean casseroles, nut roast and other delights that I miss to this day. However, not all was sweetness, excuse the pun, and light. Our mornings started with a bowl of Bircher muesli, which was not this recipe, but consisted of rolled oats (rather than the ubiquitous flaked variety) which were soaked overnight. In the morning our mother would add grated apple, generally picked in our suburban garden, blackcurrant purée and milk. I still gag at the memory. British food in the 50's was, for some, singularly unappealing. Going to a semi-independent grammar school at 11 meant that I ended up having school dinners. I don't recall a choice of main course, so perforce I started to eat meat. But the compensation for me was the range of puddings, especially the stodgy steamed variety with custard. 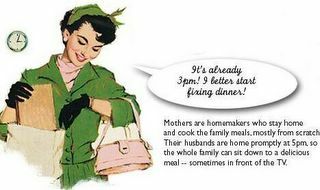 As prosperity grew in post-war Britain, there was a need for women to leave the kitchen and re-enter the workforce. Greater disposable income led to a taste for foreign foods, initially Italian, then Indian and Chinese. Meal times became more irregular and we started to get used to pre-packaged, pre-digested foods such as Vesta curries, which consisted of dehydrated soya bean mush. Now, I'm led to believe, London is one of the world's food capitals, although my web search didn't track down an Indonesian restaurant. The dietary conditions of Indonesia children are somewhat different. The prolonged economic crisis coupled with natural and manmade disasters such as drought, floods, landslides, earthquakes and the recent tsunami has not afforded all a balanced diet. The crisis was associated with a clear negative shift in food consumption. The intake of foods providing minerals and vitamins of high quality which can be well absorbed by the body such as milk, eggs, and poultry decreased markedly. The daily diet of the surveyed population appears to have become less varied and more monotonous. The frequent consumption of tahu (soya bean curd) and/or tempeh (fermented soya bean 'cake') is encouraging because it is a good source of high quality protein (and cheap!). Most schools in Jakarta, and probably elsewhere, sub-let space to fried rice and Pot Noodle vendors. Our Kid, of course, loves the snacks and instant foods, but we do give him a packed lunch for school. They don't have the attraction of the 41 lunch boxes ~ one of the many ephemeral everyday labors of domesticity ~ shown here, but we certainly hope that, thanks to vitamin supplements, he has a healthy diet. I do wonder though when he'll actually ask for fruit and vegetables. Fortunately, he does like bananas. I also wonder if and when there will be room on the political agenda here for balanced and nutritious school meals, with professional catering staff and national politicians, such as Tony Blair (who has announced a series of plans to swap junk food for 'organic and local' fresh meals) and Arnold Schwarzenegger (who wants to ban all sales of junk food in California schools and fill vending machines with fresh fruits, vegetables and milk), allocating resources. When families are unable to provide, it becomes the responsibility of national leaders. A healthy nation needs well-nourished children.